You can also buy the 128GB iPod Touch for $299. End of an era. Remember that the iPod Nano was when Apple started buying up all the available NAND, and I don't think they've stopped doing that since the Nano. Crazy. I love having a small ipod for working out, power walking etc. 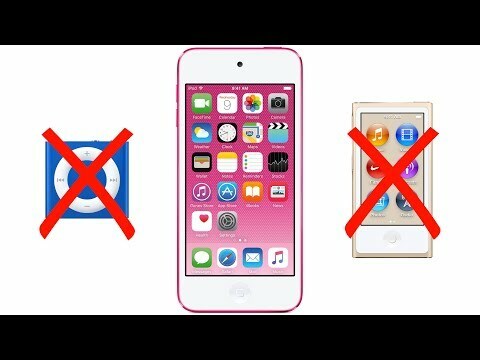 why do they keep killing off pieces of the I pod family? I have no intention of using an iphone for workouts. Have you considered an Apple Watch? It's even smaller and lighter, and you can use BT headphones, so by the time you're ready to replace your iPod you'll probably already have BT headphones, which also have a benefit of no cord flopping around. I'd been recently eying the nano as a dedicated workout player - there is a bit of a price and wearable footprint difference for the watch! Perhaps 'back2school' is a consideration...? Get what works. I still have a 3rd gen iPod Shuffle in a waterproof case with waterproof headphones for swimming. If I can get waterproof BT headphones one I upgraded from my original Apple Watch I'll retire the Shuffle. still use nano's in a couple of my cars, they stay connected permanently and contain my some of my favourites gathered over the past 20years - I've tried to replicate the playlists on streaming services but not a single one has everything I listen to. $69 Shuffle compared to a $299+ Apple Watch and $150 Bluetooth headphones? The watch is not smaller or lighter than a Shuffle. Lame comparison. No one will spend $450 to listen to music at the gym. The iPod Shuffle was the perfect device for working out and running. Apple's decision to eliminate it makes little sense. On going development costs must be near 0, and at $59 margins are high. This is a perfect cash cow. If space at stores is a premium, make it available only on the website. I'm really sad to see this go, as I use my Shuffle every day, and no other Apple product is an option for me. Once the Apple Watch gets 16 GB of storage, will cost $150 and will have strong enough battery to serve as a music player while still lasting the whole day, then it can be considered an iPod shuffle/nano replacement. Not "no one". Some are willing to pay that price. Which is what Apple is looking for. They are dropping low-capability, low-margin devices and offering high-capability, high-margin replacements. If you don't want them, I'm pretty sure your Shuffle & whatever headphones you were willing to buy will continue to work just fine. By the time you are ready for something new, it's likely that the Watch & AirPod market will have expanded and you will have options at various prices. For everything else there is craigslist & eBay. Ongoing costs are far from zero. These devices require customer support responsibilities. The firmware (a custom OS) must be maintained. iTunes must continue to support the device. iTunes must remain a product (some hope/believe iTunes to be on its way out), otherwise Apple must reprogram the Music app to manage the Shuffle. then there are manufacturing facilities Apple contracts with to build the devices. They don't just leave the production lines in place for free. There is a fixed cost to keep that in place. If if they can shrink 3 overlapping products (Watch, Nano & Shuffle) into one, there is a lot of economy to that decision. ... Get with the program! Nano and Shuffle are not gateways to Apple Music subscriptions. That's why they are dead. 2010 = $8.2b, 2011 = $7.4b, 2012 = $5.6b, 2013 = $4.4b, 2014 = $2.2b. Not only this, they reported unit sales, which in 2014 were 14.3m units compared to 169m iPhones. The total sales can't be more than a few million at this point and revenue is likely under $1b. Some of what contributes to this is how long they last. A Shuffle is a pretty durable product, it would probably last about 8 years without being replaced and this results in low sales. Apple could add storage to the Airpods at some point or in the Beats wireless products. The Watch has a few million buyers so that will have a similar effect as the iPhone. It's not necessarily that people who have iPods would be drawn to those products, it's more that people are drawn to the products and then they don't need the iPods any more. In terms of cost, you can pick up an old iPhone 4 on eBay for $60. Cars often have SD card slots or USB ports, just get a card and load it with music. There are loads of options for getting a cheap music player. This is something Apple has always done, they get rid of products that people aren't buying any more or more importantly wouldn't be buying any more in a few years. They look at sales trajectories and typically follow the ones that go up. Chasing ones that go down is going to be short-lived anyway. But either of them could have been with a simple update. The nano is better off being eliminated in favor of the Apple Watch, which is quickly dropping into the same price range. But the shuffle could have had a BT radio added to connect to an iPhone, iPad or Mac, and it would be no more an impediment to being a gateway to Apple Music subscriptions than an Apple Watch which also requires an iPhone in order to access any music. The only lame comparison are your prices and your odd suggesting that the Watch and headphones would be a single use device and ignoring that he would already has would already these devices years later when the current iPod—which could be a Nano but you ignored that because it doesn't fit your $69 narrative—needs replacing. How would you pair it when the Shuffle has no display? Could they even use the same Shuffle OS for BT? How would this affect battery life and thickness to pair with BT? Would it need more buttons or just have really confusing multi-click and long-click options so that it doesn't need extrra buttons for pairing, linking, and even dis/enabling BT as needed? Can you point to any comparative device that has no display that will allow you to pair BT headphones? If you use a Shuffle (capitalized for clarity) for sports, workouts or running, the problem is the headphone area is a dirt and sweat magnet. Apple never rubberized or weatherproofed the Shuffle line, which was one of the dumbest, most obvious things they could've done to improve the product. I still use mine all the time, but the lack of ruggedized industrial design usually causes mine to die after 3-4 years, even with simple maintenance on my part.